When children take their bicycles onto roads shared by other bicycles and cars, disastrous consequences can result if the drivers of these vehicles fail to take reasonable care for the safety of others. Both bicyclists and motor-vehicle drivers are required to follow traffic laws, or “rules of the road.” If, for example, a driver or other bicyclist violates traffic laws and posted signs in school zones, neighborhoods, or other areas in which children on bikes are present, those individuals may be held liable in actions for damages for the resulting injuries suffered by children bicyclists. If your child has been struck by a negligent driver or cyclist while riding a bike, you may be entitled to compensation for the injuries your child has suffered. Child bicycle-accident lawyer Jeff Killino is dedicated to helping families and children in situations like yours. Call him today at 877-875-2927 to learn more about your legal options. By taking these safety precautions, your child can diminish his or her chances of contributing to or being involved in a dangerous collision. If an accident nevertheless occurs, the protection of a bicycle helmet may make the difference between your child’s sustaining minor or far more serious injuries. Traumatic injuries account for approximately two-thirds of all cyclist deaths, and studies estimate that the use of a helmet could have prevented anywhere from 45-88% of these injuries. According to the American Academy of Pediatrics, however, only 11% of bicyclists wear helmets while riding. Bicycle accidents involving children bicyclists can occur for many reasons, many of which may be the fault of no one other than the child. A child who runs into a parked car, for example, if the car is legally parked, may be entirely responsible for the injuries suffered as a result. If, on the other hand, a child is injured while riding a bike because a bicycle path or road is poorly maintained, those responsible for maintenance of these surfaces may be found liable for injuries sustained by your child under certain circumstances. If a municipality or other governmental entity is responsible for such maintenance, however, the municipality may be relieved of liability for injuries suffered by a child as a result if the municipality enjoys sovereign immunity in the jurisdiction in which the action is brought. A defendant may also be protected under a state’s Recreational Use Statute if, for example, the accident occurred as a result of a poorly maintained surface on land held open to use by the public free of charge. When a landowner holds land open in this manner, the owner is relieved of the duties, under certain circumstances, of keeping the premises safe for public use and warning of dangerous conditions. The existence of this duty or lack thereof may depend, however, on whether the land is improved or unimproved. Most collisions between motor vehicles and bicycles occur at intersections, and many are the result of a motor-vehicle-driver’s negligence. Other accidents may result from a bicyclist’s negligence or a combination of bicyclist and motor-vehicle-driver negligence. Most intersection accidents between bicycles and motor vehicles occur as a result of right-of-way violations, according to statistics. Bicyclists and motor-vehicle drivers are charged with knowledge of all rules of the road, including those related to rights-of way, and ignorance of these laws is no excuse for a failure to comply with a rule’s strictures. Parents should make sure to learn these rules, therefore, and teach them to their children to avoid a finding of contributory negligence on the part of a child bicyclist as a result of violating a rule of the road or other traffic law. Different right-of-way rules apply to intersections with traffic signals and those without. In an intersection without traffic signals, the vehicle that arrives first is generally considered to have the right-of-way. If vehicles, including bicycles, arrive at an unmarked intersection at the same time, the motor vehicle or bicycle farthest to the right has the right-of-way. In addition, if one road is a major street while the other is a smaller, more minor throughway, the vehicle on the major street has the right-of-way regardless of which vehicle arrives first or which is farthest to the right. In intersections with lighted traffic signals, the signals must be followed by cyclists and motor-vehicle drivers, alike. In intersections with stop signs, the rules giving the right-of-way to the vehicle farthest to the right and to the vehicle that first arrives generally apply. The driver of a motor vehicle may be held liable for injuries suffered by a child bicyclist even if the driver’s negligence does not include a traffic violation. If a driver fails to keep a proper look-out for bicyclists and causes a collision and injuries to the bicyclist as a result, the driver may be held liable for damages as a result of negligent driving even in the absence of a specific traffic-law violation. Under the laws of most states, the contributory negligence of a bicyclist may prevent recovery for damages sustained in an accident between the bicyclist and a motor-vehicle driver if the bicyclist’s own negligence is found to have accounted for a certain percentage of fault (usually, more than 50%). In some cases, the negligence of a bicyclist that amounts to less than 50% of the fault for an accident may reduce the amount of damages to which the plaintiff is entitled. The rules of contributory negligence may vary somewhat from state to state. Your attorney will evaluate your case and advise you on the law that applies in the jurisdiction in which your action will be filed. If your child has been injured in a bicycle accident as a result of someone’s negligence, you may be entitled to damages in compensation. 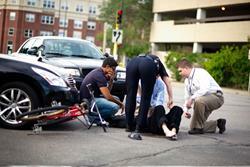 Contact child bicycle-accident lawyer Jeff Killino today at 877-875-2927 to learn more about your legal options.